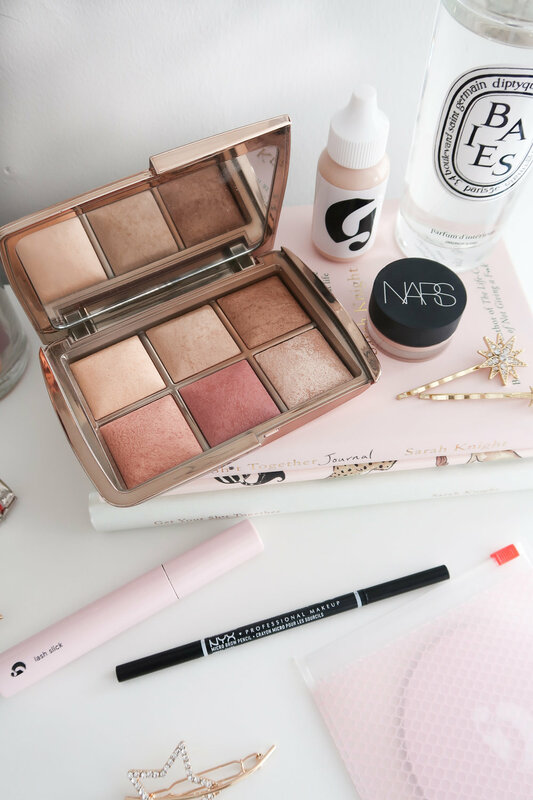 I’ve been all about a glowy and, more importantly, quick make up routine lately. I just don’t have time in the morning to contour or blend 4 different eyeshadows, I keep that time strictly for sleeping in a little bit longer. Luckily, I've managed to cut my morning make up medley to just 6 minutes, yes I timed myself. This isn’t a bash at anyone, if you want to put the entirety of your make up collection on your face, then girl do it…I’ll even pass you your brushes to help. I just thought I’d let you know all about my 6 minute routine with 5 products and 3 tools, easy peasy. The less products you have, the less time you need to put them on your face. I’ve been reaching for a few items in particular which are now part of my everyday collection, and I couldn’t be happier with them. I start off with the Glossier Skin Tint, I like to pour this onto my fingers and rub them together to warm the product up slightly, and then I apply it straight to my face and just make sure that it’s blended in nicely. I love this product for a quick glow and shot of hydration too, it doesn’t offer too much in terms of coverage though so I then move onto a concealer. The NARS concealers are some of my all time favourites, they just get it right every time. I love the soft matte concealer in particular however as this adds the perfect amount of coverage for me, especially when I apply it with a sponge. So around this point, we’re about 2 minutes in and I move onto brows. For a precise brow, I always use the NYX Cosmetics brow pencil. I find this formula is slightly waxier than the Anastasia Beverly Hills brow pencil so it stays put and also doesn’t break after 4 uses lol. If I don’t fancy a strong brow, I tend to go for my Glossier Boy Brow in brown. This little wonder product gives the most perfect, thick and feathery effect which I am very much here for. 4 minutes in, I move onto warming my face up with the bronze shades from the beautiful Hourglass Ambient Lighting palette (similar here.) I take my Real Techniques blush brush and sweep the two shades across my face, I don’t go crazy but I do like to put this pretty much everywhere. I usually finish it off with a quick sweep across my eyelids for a shadow effect which works perfect to tie it all in. I then pop a bit of blush on my cheeks and I’m good to finish off my look with a slick of mascara. I give my lashes a very quick curl and I then use my everyday mascara, Glossier’s Lash Slick. This gives me the perfect separated, open eyed look which I love. I know this mascara is a bit like marmite, with a few people wishing it did more, but I find the amount of product perfect for me. What I love most about using this daily, is that it holds a curl really well, so I don’t have to worry about having to get my curlers out at around lunch time! So that’s it, 6 minutes is up and I’m ready to head off to work for the day. Do you have any staple make up products in your routine? Let me know!